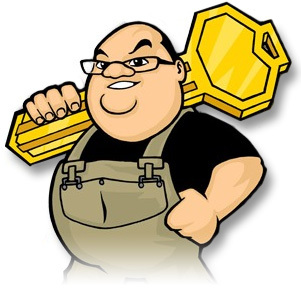 My Brand is the Big man with a key on his shoulder and is actually a caricature of me, the current one in use is actually my 2nd one as I have had to update it as I have got older as you can see my belly has got bigger I have a few more chins and now wearing glasses full time. But this logo of Big man with key on his shoulder has done me and my business the world of good as when I pull up at a customer’s house they instantly see the resemblance of the logo on the side of the van with my name Lee clements & son’s written on the side and me standing at their door. It I feel it gives you my customers the feeling that you are dealing with a genuine tradesman and not a national company also someone who has complete ownership of the business. My customers have told me that they have seen my van around Warwickshire/Solihull and Coventry but couldn’t remember the name of the business but remembered that the locksmith that they wanted to use was a Big man with key on his shoulder or a fat man with a key on his shoulder.